In another sign of the heightened tensions over China's militarization of islands in the South China Sea, the United States has disinvited China from participating in an upcoming large-scale international naval exercise to be held off of Hawaii. Visiting Washington, China's foreign minister condemned the U.S. move calling it "very unconstructive" and "unhelpful." The move is in response to China's continued placement of military hardware on seven artificial islands in the Spratly Island chain that it claims as its territory. "China's continued militarization of disputed features in the South China Sea only serves to raise tensions and destabilize the region," said Lt. Colonel Christopher Logan, a Pentagon spokesman. "As an initial response to China's continued militarization of the South China Sea, we have disinvited the PLA Navy from the 2018 Rim of the Pacific (RIMPAC) Exercise," he added. "China's behavior is inconsistent with the principles and purposes of the RIMPAC exercise." Held every two years, this year's version of the RIMPAC exercise was to begin in late June and end in early August. The exercise is largest international Navy exercise, with 27 nations slated to participate in this year's version. China's navy participated in a limited role in the 2014 and 2016 versions of the exercise. The move to rescind the invitation to participate in this year's exercise is directly pegged to China's buildup of large-scale air and sea facilities on the seven artificial islands it has built up in the Spratly Islands. In 2015, Chinese President Xi Jinping made assurances to President Barack Obama that China was not seeking to militarize the islands, but satellite photos indicate China has consistently placed military equipment on the islands, and built up runways and port facilities that could be used by China's military. 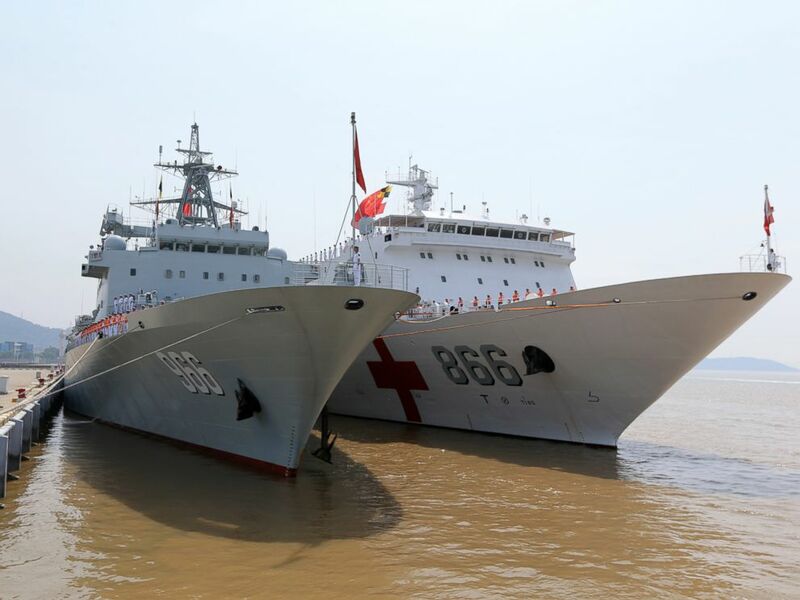 The supply ship Gaoyouhu and the hospital ship Peace Ark are gonging to set sail to Hawaii to join 2016 Pacific Rim (RIMPAC) on June 15, 2016 in Zhoushan, Zhejiang Province of China. "We believe these recent deployments and the continued militarization of these features is a violation of the promise that President Xi made to the United States and the World not to militarize the Spratly Islands," said Logan. "We have strong evidence that China has deployed anti-ship missiles, surface-to-air missile (SAM) systems, and electronic jammers to contested features in the Spratly Islands region of the South China Sea," said Logan. "China's landing of bomber aircraft at Woody Island has also raised tensions." Logan added that while China has claimed that the construction on the islands has been for peaceful purposes "the placement of these weapons systems is only for military use," said Logan. "We have called on China to remove the military systems immediately and to reverse course on the militarization of disputed South China Sea features." The U.S. move was condemned by China's top diplomat who coincidentally was visiting Washington to meet with Secretary of State Mike Pompeo. State Councilor Wang Yi labeled the rescinding of the invitation "very unconstructive" and "unhelpful to mutual understanding." "We hope the U.S. will change such a negative mindset," he said at a press conference with Mike Pompeo. He added that both the U.S. and China are "big countries" and there should be "greater cooperation at mil-to-mil (military) exchanges to increase mutual trust." Wang also dismissed claims of "the so-called militarization" of the islands in the South China Sea. "China is only building civilian and some necessary defense facilities on our own islands," he said. "That is the right to self-defense and preservation of every sovereign state," said Wang who compared the buildup to U.S. bases on Guam and Hawaii though on a "smaller scale" and only defensive in nature. While not addressing the rescinded invitation directly, Pompeo said the U.S. has "expressed consistent concern about militarization of the South China Sea. We had a chance to talk about that, and I will leave to our militaries to talk about their efforts together." News of the U.S. action was first reported by The Wall Street Journal.